Most people understand that the best way to help people who are in economic need is to help them in a way that allows them to help themselves become financially self-sufficient. Doing things this way not only assures that the economic goals are the same for both the giver and the recipient of aid, there is also a means and intention by the giver to truly help others become less dependent on them and, ultimately, have a better future. It is for this reason that KIRF strives to do long-term and sustainable relief through education for families in need. KIRF's mission is not only to help people help themselves in a disaster with disaster relief, it is also to help people have a better future through education. 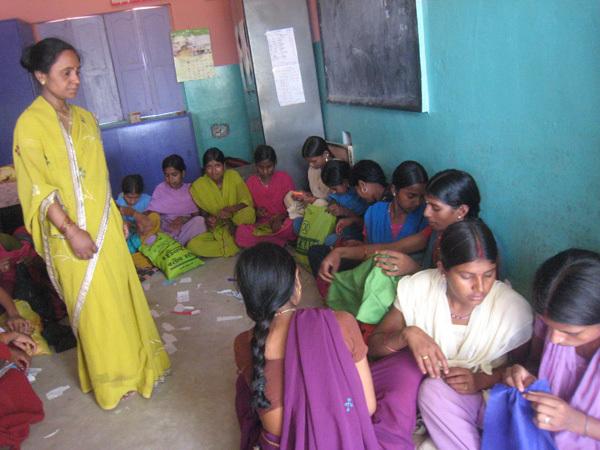 The KIRF Sewing Centre in the rural village of Shekhwara in Bihar, India is an example of an annual in-kind grant and educational project that was founded by KIRF. The Sewing Center is located at the Shekhwara Village School. The school is about 10 km from World Heritage site and Buddhist pilgrimage temple called the Mahabodhi in the ancient town of Bodhgaya. The KIRF Sewing Centre school is primarily a vocational training center for young mothers who need to earn an income to feed, clothe and care for their children. In rural Bihar, many women are left alone with their children at their in-laws for months at a time while their husbands are working for months at a time as migrant laborers elsewhere. When these women are able to earn an income or offer a valuable local service such as tailoring, they are not only helping themselves and their children, they are helping their entire extended families. The KIRF Sewing Centre serves between 20 to 25 students, many of whom have no formal academic education. In addition to sewing and embroidery, they are taught basic literacy skills and given social support. We started the Sewing Centre in 2009 with a donation of three non-electric sewing machines, sewing supplies, textiles and a small stipend for a part-time sewing instructor. Today, dozens of young women have graduated from the KIRF's sewing program with a moneymaking skill and a high status certificate of ability that is proof of their ability. The program is a popular one in the rural village where it is located and there is a waiting list to attend. The Sewing Center is located at the Shekhwara Village School, a free school established by Diane Kirwin and several local Indian humanitarians in 2009. This school is the only quality academic education available to its 100 to 110 students in the area. Some students walk as far as 3 ½ kilometers (about 2 miles) to school each day. There are currently five classes at the school and snacks are provided five days a week for the students. There is also a Saturday yoga class. The Shekhwara Village School also hosts the Kirwin International Health Clinic that is open on Saturday mornings at the school. The clinic provides free health and medical services to families of the school’s students. Each week, about 30-40 patients, mostly women and their children, get treatment. Below are recent photos of the Health Clinic at the Shekhwara Village School in Bihar, India.